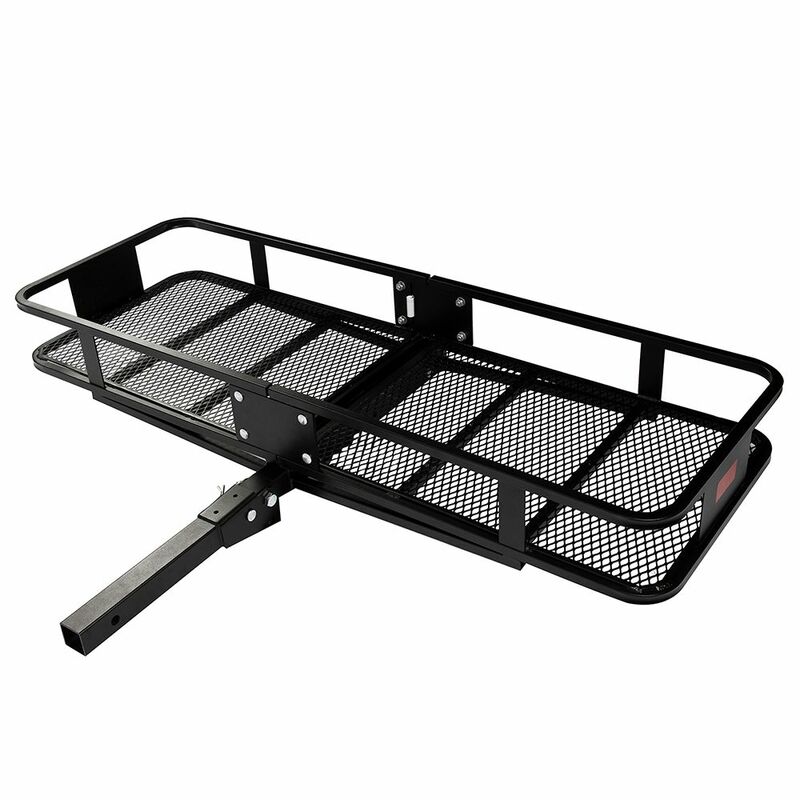 Use the Erickson Deluxe Cargo Carrier for that extra cargo there is no room for. Made of heavy duty steel square tube construction. Black powder coated for corrosion resistance. Foldable frame so it can be folded up to the vehicles when not in use. Maximum load capacity of 500 lb. designed Designed for 2" Receiver. 20" deep and 60" Wide. The perfect solution to protect the cargo area in your vehicle from leaky grocery bags, garden supplies, mud-covered or wet sports equipment, sand covered beach gear. Great for dog owners and to carry debris, mulch, hay or construction gear. Designed for the cargo area behind the rear seats in SUV, Mini Vans and hatch back style vehicles, Dimensions: L 86cm x W 107cm. (adjustable +/- few cm for different vehicle brands). The liner turns the vehicle into a cargo vehicle to transport messy loads. The liner can be installed and removed in few minutes, it is not permanently attached to the vehicle and is supplied with all parts required for installation. The liner protects the back of the seats and the interior walls of the vehicle. It also protects the bumper when loading and unloading cargo and helps to prevent the users pants from getting dirty. It helps to preserve the resale value of your vehicle. The Liner is easy to store when not in use. The perfect solution to protect the cargo area from leaky grocery bags, garden supplies, mud-covered or wet sportive equipment, sand covered beach gear. Designed for car trunks with dimensions: length: 91cm x width 102cm (adjustable +/- few cm for different vehicle brands). The trunk Cargo Liner can be installed and removed in few minutes, and is supplied with all parts required for installation. The Cargo Liner protects your vehicles trunk. It also protects the bumper when loading and unloading cargo. The system helps to preserve the resale value of your vehicle. The Cargo Liner is easy to storage when not in use. Light weight aluminum truck rack, 800lb. Capacity. Our patented clamp design makes installation easy, with no drilling required! Great for various box lengths, as all stands can be placed in ideal position. Fully adjustable load stops can be moved along length of supports to fit various loads. Perfect for contractors with building material, or weekend warriors with canoes, etc. Deluxe Cargo Carrier 500 lbs Use the Erickson Deluxe Cargo Carrier for that extra cargo there is no room for. Made of heavy duty steel square tube construction. Black powder coated for corrosion resistance. Foldable frame so it can be folded up to the vehicles when not in use. Maximum load capacity of 500 lb. designed Designed for 2" Receiver. 20" deep and 60" Wide. Deluxe Cargo Carrier 500 lbs is rated 3.5 out of 5 by 4. Rated 1 out of 5 by Kevin from Used once, and already shows signs of rust.... Used once, and already shows signs of rust. Rated 5 out of 5 by Penny from I have installed my cargo carrier, but haven’t actually used... I have installed my cargo carrier, but haven’t actually used it yet. I will be soon! The style and workmanship was exactly like described on the website. I’m looking forward to getting lots of use from it when I travel to my art shows. Rated 4 out of 5 by Te from Very satisfied, came in handy for our weekend getaway.... Very satisfied, came in handy for our weekend getaway.